Entering the space, guests are immediately transported to another world, in the far East. 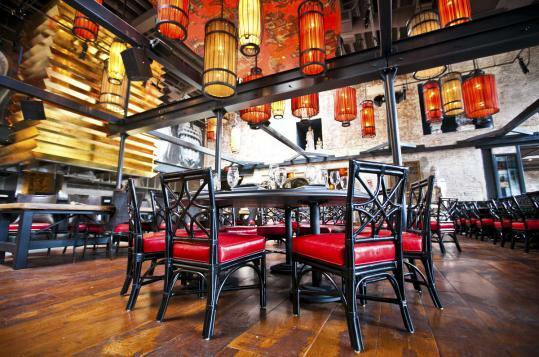 Impressive, oversized, custom, wooden Asian doors conceal this culinary sanctuary. 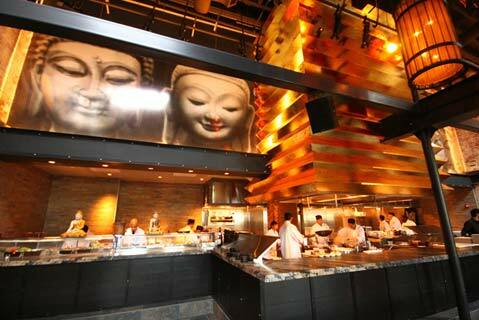 The bar evokes a sensual Asian experience. The lighting is spectacular. Hundreds of small red lanterns float from the ceiling offset by strands of seashells which are beautuflly illuminated. The open kitchen is a dining room showpiece, complete with a custom, center wok station with its oversized gold-leafed ziggurat hood. The food is impressive, a mix of chinese food, steaks & sushi. Shortly after the Red Lantern Opening, the restaurant was met with rave reviews. Only a short walk from our Boston boutique hotel, you will find equally as thoughtful interiors & service at Clarendon Square. We have collect, art & furnishings from all over the world & even a few local places you may recognize. Our guestrooms are spacious & stylish, designed to promote relaxation. A day filled with sights in and around Boston can require a lot of energy. Stay at a boutique hotel with evening conveniences close to restaurants and bars. The South End hosts a variety of restaurants, so if Asian cuisine is not your thing, just ask one of your innkeepers for a recommendation. With over 50 restaurants in the South End alone, the Boston dining scene is sure to have something to impress you & leave your mouth watering. This entry was posted in Uncategorized and tagged boston, boston bed and breakfast, boston boutique hotel, boston new restaurants, red lantern, south end dining, south end restaurants by admin. Bookmark the permalink.